Welcome to Reader Appreciation Week at Droid Life! Been wondering what last week’s teases were all about? Here is your answer. Welcome to Reader Appreciation Week here at Droid Life! Over the next 5 days, we’ll be doing our best to give and show thanks to the greatest Android community in the entire world. Without the contributions from all of you, this site would never have grown into what we think is one hell of a place to talk about all things tech. The stories and experiences, tips, tricks, favorite apps and occasional jabs at our fruit foes have made this into a special place to spend your days on the internet. So the goal is to take everything that you are seeing pictured above (plus more), and hand it all out through a variety of contests and giveaways. 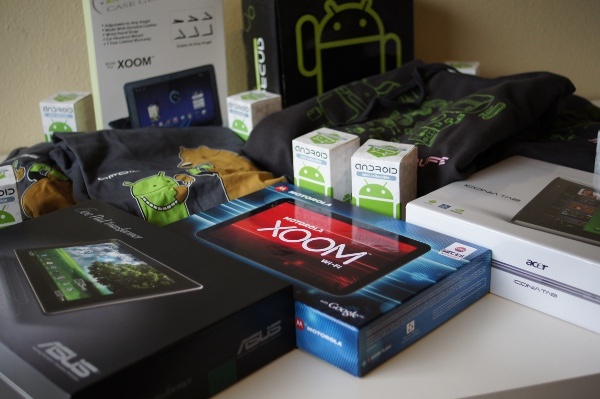 That’s right – those 3 tablets (Asus Transformer, Motorola XOOM WiFi, and Acer Iconia), case of Series 2 Mini Collectibles, DL limited sweatshirts and T’s, various applications, etc. will be in the hands of DL readers very soon. We’re incredibly excited to have the opportunity to do something like this. And while we wish we could have done even more, we hope that this week will touch at least a little on how thankful we are to have spent the last year and a half with all of you. It’s clear that there are 3 major toys up there that you will all be vying for, so to make it easier for you to sign up to win one we thought we’d let you know how this will go down. In about an hour, we’ll open up the entry period (details still to come) for the Asus Transformer (16GB model). On Tuesday (tomorrow), we’ll cut it off at 2PM Pacific and choose a winner. Then on Wednesday morning, we’ll open up the entry period for the Acer Iconia with a winner being chosen the following day (Thursday) at 2PM Pacific. The Wifi XOOM will be last to go and will have an open entry period starting Friday morning and running all Memorial Day weekend with a winner being chosen on the following Tuesday (May 31). So we’ll be focusing on each tablet for almost a full 2 days before choosing a winner. We’ll notify you on entry details and requirements each of those mornings. The rest of the stuff (shirts, collectibles, apps, etc.) will be given away at random, spurt-of-the-moment times throughout the rest of the week. You could win by doing something as simple as answering a question that we pose on Twitter or Facebook. It’s going to be a wild time, so like we mentioned on Friday, you may want to follow us on Twitter and Facebook if you aren’t already. Subscribing to our feed will also be essential since many of these things will be given away from details through a blog post. 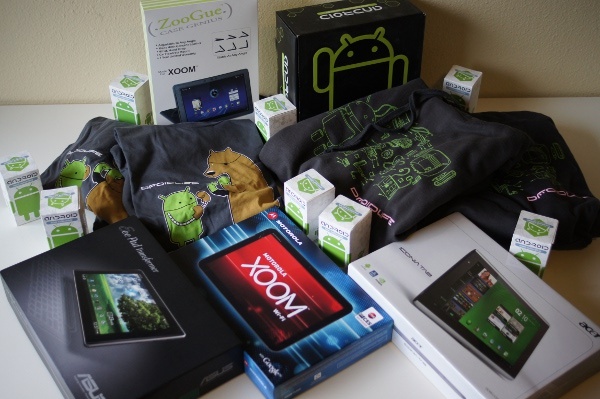 We’d hate for you to miss out on a chance to win one of these fabulous prizes. Again, we’d just like to thank everyone for making this a special place. Let’s start giving sh*t away!